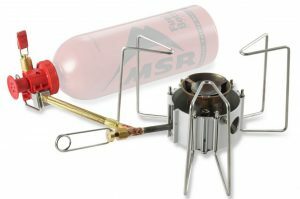 Having the right camping stove can mean the difference between an awesome camping experience and a mediocre camping experience. While cooking over the camp fire is always fun, sometimes a proper camp stove is necessary in order to put out great meals for the entire family. 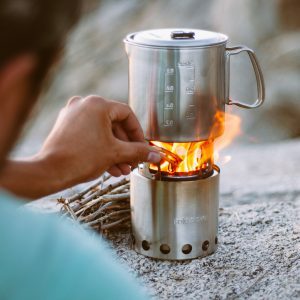 There are tons of different kinds of camping stoves to choose from and finding exactly what will work best for your situation is key. 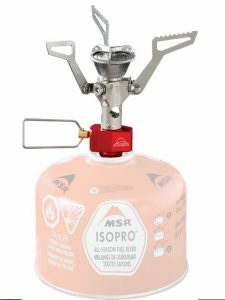 Will you be backpacking and need a lightweight camping stove or will you need a 2 burner camping stove in order to feed a big group? 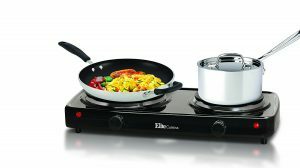 I’ve compiled a list of the best stoves in each category below. Pro Tip: It’s always a good idea to have more than one type of stove in your camping kit. 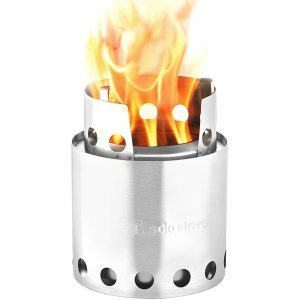 It can always be used as a backup in case of emergency or if your main camping stove suffers damage or is inoperable. Backpacking Stoves tend to be lightweight and compact. They often are 1 burner and use minimal fuel. When looking for a stove for backpacking, be sure to find one that boils quickly and can withstand the various conditions you might encounter (wind, rain, freezing temps, etc). 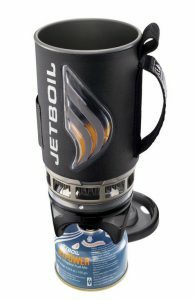 This is actually a full cooking system that includes the pot stabilizer, supports and jetboil cooking cup. The only thing not included is the canister of fuel. It comes in 6 different unique colors/patterns including a realtree camo print. Boil liquid in just over 2 minutes. Enjoy an easy push button ignition that gets you quickly started heating your meal or beverage. 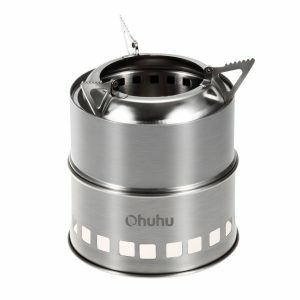 This is one of my favorite compact stoves that is perfect for backpacking. It simply attaches to the fuel canister and it holds a variety of sizes of pots. I love how much space it saves in my pack and that it doesn’t require a lot of set up. It has a fully adjustable flame making it easy to choose between a rolling boil or a soft simmer. Gourmet meals in the backcountry are easy to whip up with this little gadget. This is a completely durable stove that features great stability and the ability to accommodate large group cooking situations. The DragonFly can actually be utilized for more gourmet outdoor cooking including baking for those that want to try their hand at it. Having more than one burner on your camping stove allows you to cook more than one thing at a time or to cook more of the same thing for a big group. 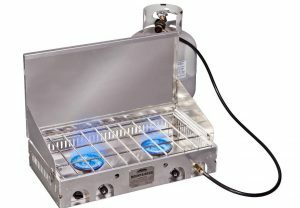 Whatever you situation, a 2 burner camping stove is a lifesaver in most campsites with more than 2 people. 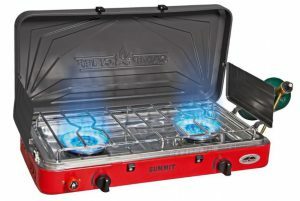 The Summit 2-Burner stove is a workhorse with 2 big 20,000 BTU burners. There is also a temperature control that allows you to fine-tune the flame. With a strong steel cooking grate, you can even use heavy cast iron cookware without damaging the stove. Cooking for a large group is so easy on this surface as well. I’m also a fan of the adjustable legs on the bottom of the unit that let you level out the stove if you are on an uneven surface. 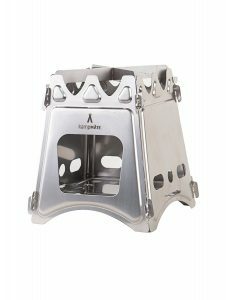 The Mountaineer is a heavy duty, slightly bulky 2 burner stove that can handle whatever you throw at it. It is made from corrosion-resistant aluminum that is lightweight and super durable. Table legs can be purchased and added in order to use this stove for tailgates or barbeques. With an regulator and a 5 ft hose, the Mountaineer is designed to be used with a bulk propane tank so you can cook virtually anything that requires more fuel and longer cooking times (like game-day chili). Weight: 9 lbs. 5 oz. 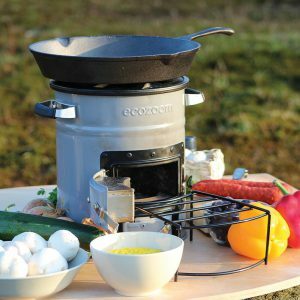 This camp stove system includes a 5 L FluxPot and a 10 inch ceramic coated fry pan. I like this stove because it can fold up easily but still allows you to have a 2 burner stove while backpacking or camping. It is a lot easier than carrying around one of the larger briefcase style 2 burner stoves. The Maxi-Matic electric stove features 2 different sized cast iron cooking surfaces (7 inch and 6 inch). It is powerful at 1,440 watts and is small, so it won’t take up too much room in your camping gear. This stove is also perfect for tiny houses and pop up campers. Cooking with wood is great because wood is usually very plentiful and you don’t have to worry about running out of fuel. If you are camping in an area that allows you to gather firewood then a wood stove is also going to save you money. 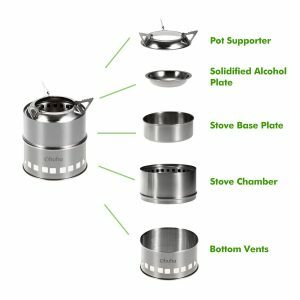 The Solo Stove is designed with a double wall that has unique airflow properties. This makes it extremely efficient. It runs on just a handful of twigs or an alcohol burner. There is also very little smoke produced by this stove as a result of the design. Solo Stove is the 2017 Gear of the Year winner and is a Backpacker Magazine Recommendation. 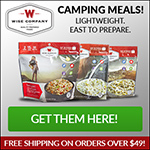 It is a must-have for all serious backpackers, survivalists, and campers. 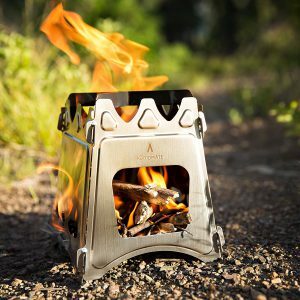 The WoodFlame is a light weight, collapsible camping stove that is made with high grade stainless steel. It folds flat and comes with a nylon carrying case. The Ohuhu Wood Burning Stove is easy to set up and extremely affordable. It has a stable cooking platform (3 arm pot support system) that reduces the chance of tipping over. There is no feeding slot on this stove, so you cannot add more wood while there is a cooking pot in place. However, this design gives the stove a consistent, hot and efficient burn that feeding slots would interfere with. 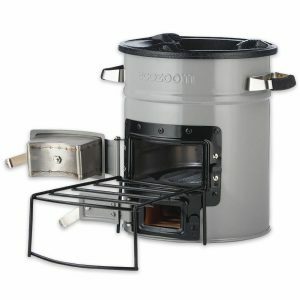 The EcoZoom Rocket Stove is great for outdoor patio, camping and emergency situations. It is eco-friendly and energy efficient. Cooking can be done with wood, charcoal, or solid biomass fuel. The Versa is also extremely durable and has reinforced doors to ensure that it will last for a long long time. Solar stoves are a great way to utilize the power of the sun to cook your meals. When fuel is not available or wood cannot be burned because of burn bans, the use of a solar stove is priceless. Having at least one solar stove in your camping or survival gear is a very good idea. It makes a great backup stove and is also great for the environment. 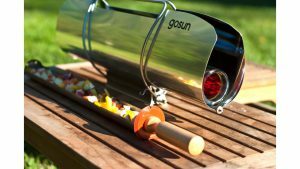 The GoSun is a extremely fast and powerful with the ability to cook a meal in 20 minutes using only the heat from the sun. It reaches temperatures of over 550 degrees F. It can bake, boil or fry any food you want. 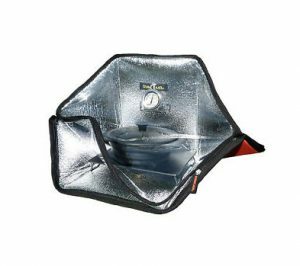 The Sunflair solar oven utilizes the sun to gently simmer liquids or food. The 3 wall system helps to capture and reflect the sun’s rays. Included is a thermometer to help you know what temperature you are cooking at. Many people use this particular cooking method by setting it up on the dash of their vehicle. This entry was posted in Gear Reviews, Uncategorized and tagged Backpacking Stoves, Best Camping Stoves 2017, Camping Stoves, electric Camping Stoves, Solar Stoves, Wood Burning Camping Stoves. Bookmark the permalink. I am really intrigued by the solar options. We live in a region that is prone to disasters and it seems like they would be a natural fit for any survival kit. Do you find that these types of equipment do reach the temperatures advertised? Being able to boil water in a disaster type of situation could be life saving. I too live in an area that has lots of natural disasters (Texas Gulf Coast)… in fact, as I’m writing this we are currently going through the massive flooding in Houston caused by rain from Hurricane Harvey. The solar options definitely reach their temperatures but only if you are in FULL sun and you’ve positioned it correctly. Right now, the solar options wouldn’t work for me, because we haven’t seen the sun in 3 days. This is the exact reason why I suggest people have at least 2 different options. I have a wood burning stove that will allow me to boil water or cook a meal until this rain ends and I can switch to the solar option if needed. What a great variety of camping stoves! Reading about all of them brought back many happy memories of camping and lake country living. Without a stove, even when in a cottage.Sure, it’s great to have the skill to cookover a campfire but that isn’t a;ways possible. These stoves cover the range of cooking for oneself, or for a group. How handy is that. I love the mini solar cooker. It looks light too. Ihaven’t tried one like that, have you? Yes, I have tried the mini solar cooker. My husband actually uses it to heat meals while he’s on job sites. He places the cooker in the dash window of his truck. He’s mostly reheating food though, but it actually does reach extremely high temps.